Keen to get involved within the community, and having connections to the local football team through Walter Edwards, we were invited to join them for a dementia coffee morning. The men went on Fridays for chats with the players, a look around the stadium, shop and coffee and cake whilst reminiscencing over photos from yesteryear. The gentlemen thoroughly enjoyed this time getting out and chatting with others, and have decided that they would definitely like to keep up attendance at the Coffee morning. 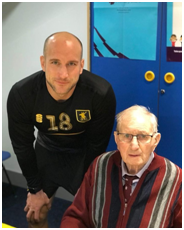 Local football hero Walter Edwards with current Mansfield player David Mirfin. Unfortunately on the 5th November we received the deeply saddening news that Walter had passed away whilst in hospital. Walter was the clubs oldest living player at 94. Walter signed for the club in 1947 and turned pro three months later; he scored an impressive 5 goals in twenty-five games before joining Leeds united. Walter was a loved member of our Magnolia Family and will be missed by all the staff here that enjoyed chatting with Walt and looking over his football memorabilia. Our thoughts are with the family at this time.